First let’s talk about electricity costs. If you do nothing to affect the electricity situation on your property in Woodland, do you think your bill will decrease over the next few years, or even decades? Certainly, you expect to pay considerably more for your electricity ten to twenty years from now. 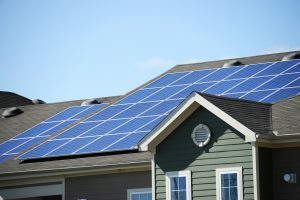 So when you invest in photovoltaic panels immediately, you begin saving money on your utility bill the moment you turn on the power of sunshine! In addition to saving you money from day 1, purchasing photovoltaic is the right thing to do for the threat of global warming! Since photovoltaic electricity creates electricity without burning fossil fuels, it is most certainly the way of the future. So it is the right thing to do for your planet, family, wallet and future! Can photovoltaic still get cheaper? With the help of a Solaron sales technician, yes it can! Both municipalities and governments offer different incentive programs to effectively cut the cost of photovoltaic installations. These bonuses rely on your specific area, but can considerably cut the cost of buying your photovoltaic panels. So call Solaron today to get more information about how you can save money and the threat of global warming by means of photovoltaic power!